Kabir News Gaming Review: Burgeria To Go! Flipline Studios made its name with restaurant management games starting with Papa’s Pizzeria, a part of the Papa Louie series of games. For those unfamiliar with these kinds of restaurant and time management games, one of the most well known examples would be the Diner Dash series. The series of flash games involved a worker taking over one of Papa Louie’s numerous restaurant chains in a variety of cuisines. 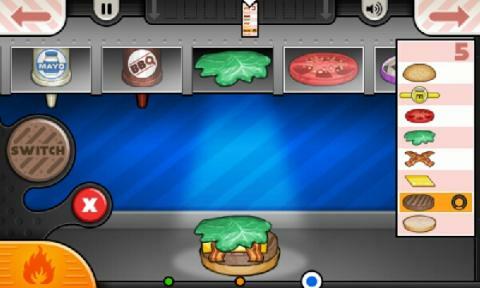 Burgeria To Go is the app version of the second game in the management series, 2007’s Papa’s Burgeria. The game mechanics in Burgeria To Go—and all Gameria titles—area extremely easy to catch on to. Your main objectives are to take an order, time your cooking of the main ingredient (in the game, it’s the patty), then construct the burger per the order ticket. If you’re successful at get the burger out quickly, properly cooking the patty, and putting the burger together you should score high on these three main areas. From there you’re given a tip by the customer which can be applied to restaurant bonuses later. For those with smaller smartphones, you might find it harder to accurately drop the ingredients in place, but it’s definitely possible. Also most of the purchasable bonuses are more towards improving customer waiting time. Other than that, there’s no complex gestures or rules here. Each preparation works the same way and it really just comes down to accuracy and timing. Flipline’s art style is distinct for its games with characters usually having oblong bodies and circles for hands, feet, and the head. On mobile, the art style reflects the main flash version of the series. The graphics in the game are fairly crisp and won’t kill your smartphone’s battery or cause lag by eating resources up—at least in this version. If you have Papa’s Burgeria HD it will obviously come off as clearer. The sound is really nothing special to right home about. It fits the gameplay and it’s well recorded. The music loops and there’s the sound effects of patties sizzling or bells going off. Burgeria To Go offers a lot of time to enjoy the game while the actual challenge here comes in timing, scoring a perfect 100 percent, and the player’s endurance in continuing to play through each new customer and get gold on them all. This is where the game can become tedious since you’re doing the same thing over and over, but for the most part the game is extremely enjoyable. 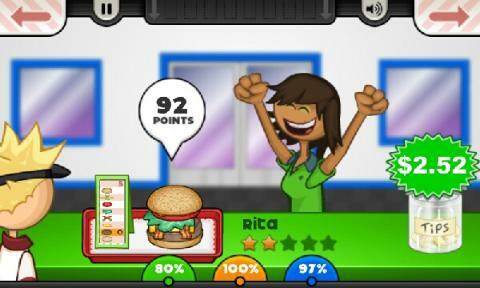 Burgeria To Go is an extremely fun time waster of a game. There’s no story to actually get into, it’s light on canon, the characters aren’t memorable since there’s no actual dialogue or background on most, and it’s easy to pick and learn the play with a very short tutorial. Not only that, but Burgeria To Go is a very inexpensive game. I definitely suggest picking up this one up.